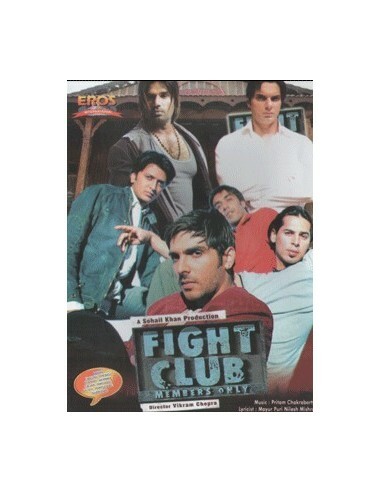 Fight Club is an exhilarating journey of four friends Vicky (Zayed Khan), Karan (Dino Morea), Somil (Ritiesh Deshmukh) and Diku (Aashish Choudhary), who in a constant endeavor to help each other, get entangled in a web of incidents, some romantic, many funny and all that test the extremes of their friendship. These four friends who could be mistaken for brothers; offer an example of wonderful camaraderie, all throughout a journey with numerous highs, twists and dark turns. An exciting journey is accelerated when Vicky stumbles upon the design of a Fight Club. A club which gives people a platform to score with their enemies in an atmosphere of fun, action and excitement. Amidst the on-going fun, team fight club get entangled in affairs of the heart and mind with Anu (Dia Mirza) and Shonali (Amrita Arora) which thicken their bonds tighter…and make them travel to Delhi to look after a nightclub, 'Crossroads', which is in the eye of a storm created by Delhi's most dangerous gang lords. Gang lords who kill to survive! In the ongoing ever-increasing drama, the ex-king pin Anna's (Suniel Shetty) brother Mohit (Yash Tonk), gets killed. This fills Anna with vengeance …situations take an ugly turn... time calls for a clash... Dinesh (Ashmit Patel) a merciless soul, masterminds the plan of a killing. His brother Sandy (Rahul Dev) supports him strongly as always. Team Fight Club calls on their ace, Sameer (Sohail Khan), a power packed bouncer to tilt the balance in their favor. In the puffed up atmosphere of fists and fights Sameer finds love in the name of Komal (Neha Dhupia).